Discussion in 'Online Games - News and Reviews' started by Kotsy, Nov 4, 2014.
the sounds to get you spinning to some great winning combinations. graphics makes it enjoyable to play. This is an online video slot that has taking the basic slot game and added a bit of bling to it. 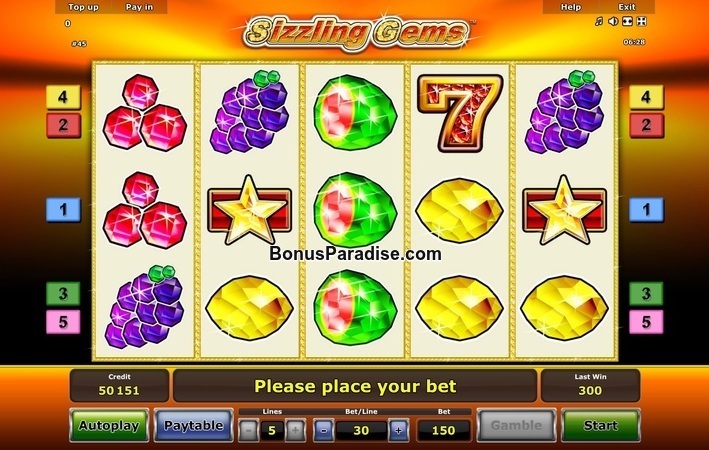 gems and fruits will payout left to right except the Scatter Gold Star symbol, which could payout anywhere on the reels. Spinning and getting 5 will bring you the highest payout for this slot game. Our gleaming winning symbols are Gold Star Scatter, Gem filled Wild Seven, Watermelon, Grapes, Sapphire, Lemon and Rubies. Payouts on this slot game are dependent on the amount of your bet. The higher your bet, the bigger your win. Players need to find a comfortable bet amount and stick with it. Play around with the minimum amount of 40 and see how you do. If it's not hitting, the try increasing the amount bit by bit. This slot game can surely payout once you get into the zone. created some of the most enjoyable basic slot games out there. There may be no free spins or bonus rounds, but this one will surely be gleaming with wins. I like the gems! The Slot looks luxury!